In May 2015, GAFFI issued a call to reduce AIDS deaths to under 500,000 by 2020 by provision of fungal diagnostics and antifungal therapies (GAFFI Roadmap). In conjunction with increasing antiretroviral therapy coverage (90-90-90- meaning action on fungal diseases will achieve a million more HIV survivors each year by 2020), diagnostics are also required for cryptococcal meningitis, Pneumocystis pneumonia, disseminated histoplasmosis and invasive aspergilllosis. Collectively these infections probably account for nearly half the current AIDS-related deaths, but since diagnostics are very often either not available or performed, this is uncertain. The key tests that need to be widely available are cryptococcal antigen; microscopy or PCR for Pneumocystis and Aspergillus antibody testing. In the Americas, histoplasma antigen testing is needed as well. 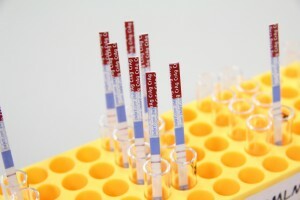 The cryptococcal antigen test (LFA) has a 99% sensitivity and 100% specificity and is inexpensive and easy to use. Microscopy for Pneumocystis is low cost with a 75-90% sensitivity and a high specificity and PCR is superior with a ~95% sensitivity and 100% specificity. Aspergillus antibody has a 96% sensitivity for chronic pulmonary aspergillosis and 98% specificity in the African setting; its utility for invasive aspergillosis in AIDS needs more studies. Histoplasma antigen in urine has a >90% sensitivity and high specificity. Access to the antifungal drug amphotericin B is a limiting factor for good outcomes, since it is the most effective agent for cryptococcal meningitis and for disseminated aspergillosis. Unfortunately more than 50% of African countries, including Nigeria – the country with the second largest AIDS population in the world, do not have amphotericin B licensed or available. Fluconazole is widely available, but in several countries only as part of the Diflucan Partnership Program (Benin, Cambodia, Cameroon, Chad, Dominica, Lesotho, Nigeria, Togo, Trinidad and Tobago). Itraconazole is also highly effective for histoplasmosis and orally effective for invasive aspergillosis, but can be costly and is not yet on the WHO Essential Medicines List (EML).